This set was made from examination of a 1962 Strat that had "The Tone". Alnico 5 magnets but we use our modern stagger to work with today's strings and flatter radius neck, and 42 ga wire all 3 are "F" 52mm spaced. This set will cover the 61 - 64 Strat tones so Knopfler ('61 Rosewood fret board), Rory, SRV "Scotch", Hendrix studio Strat and more. 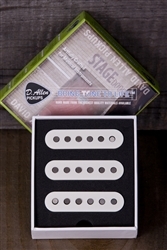 These are the clearest, nicest pickups I've ever played. I had the pickups too high after getting them installed and the tone wasn't quite there, but after Mr. Allen's advice I lowered them closer to the pickguard and they came alive. IMO, these pickups are perfect! The sound is extremely balanced, the highs ring like never before, and the bridge is the nicest most usable sound I've had in a strat - twangy, almost Tele-like. Replaced the stocks out of a Fender 62 AVRI Hot Rod. The 2 and 4 positions have the most musical quack I've heard on a strat, MUCH better than the 57/62s. If you like SRV and Hendrix, you'll LOVE these pickups, but they are also versatile enough to play any style. I installed the .047 capacitor recommended by Mr. Allen and it seems to have warmed up the guitar as well. Can't say enough good things about these pickups as well as Mr. Allen's service. If you're on the fence about these, get them and set them low...you won't look back! !